My friend Russell is a fantastic photographer but slightly less enthusiastic blogger. He took the good pictures in the ebcb book. I think he's too busy taking pictures. Fortunately for me though he's started taking pictures of some of the minutae of his daily life and he's going to email them to me so I can stick them up here. They seem the perfect accompaniment to my musings about the ordinary and the everyday (always assuming I get round to those musings). 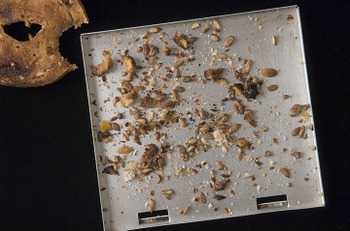 This is the first one, a marvelous portrait of the detritus that lurks in your toaster tray. Take that crumb tray to a fortune teller. They could probably predict your future just as easily from that as they claim to do from your tea leaves. i think there is real beauty in the remains of the plate, so to speak -- I actually started tracking "clean plates" recently @ rubbernecker.typepad.com/cleanplate though i've learned from others that the feeling isn't as great toward a clean plate unless you are the eater of the plate...otherwise it just looks unappealing and 'wrong' -- time to do dishes, get on to something else, etc. vs a reminder of what came just before. interesting that even the mundane elicit different reactions depending on your relationship to it.